Ford 1999 2000 2001 2002 2003 2004 Ranger Radio AM FM CD CS IPOD IPAD MP3 Input. FORD AM FM CD CASSETTES WITH AUXILIARY INPUT for use with IPOD, MP3, SATELLITE, and MORE. This is the newer version of this radio that does not have the typical display problems. This unit is a Ford and Mercury Radio with Green display AM FM CD Cassette. This radio uses the common spring clip mounts. Part number is YU3F-18C868-AA. This radio has been cleaned, serviced as needed, and upgraded with auxiliary input, then re-checked. Appearance is gret and function is perfect. No codes required, it will plug and play! Operation of the iPod jack is a snap, just plug your accessory in and you will be listening to it through all of your car speakers. Use the volume control on the radio as you usually would, same with the bass, treble, fader, and balance. Press the clock button and you have clock display. There is no compromise on the audio going into the jack as it is running straight into the amp. Please contact seller with fitment or function questions or to request removal tools as they will not be included by default. Technical support provided by 1 Factory Radio. 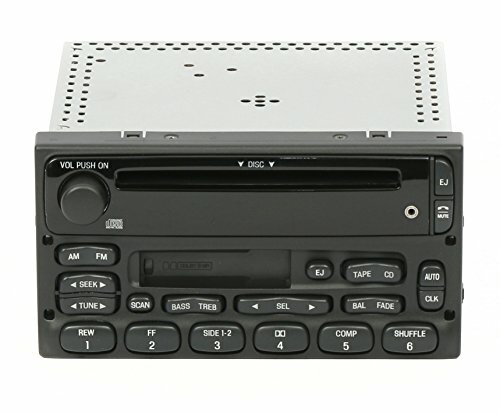 Professionally Remanufactured OEM AM FM CD Cassette Radio Modified with Auxiliary Input in the face for use with iPod, iPad, Android, Satellite Radio, mp3 Players and more! Plug and play functionality.